Stretch toe rings are a newer version of toe ring meant to answer the discomfort caused by toe rings made of metal, that do not always fit properly. The problem with toe rings made of sterling silver or of gold is that they all too often are too large or too small to fit properly. This can mean several things—that a toe ring too large easily falls off and gets lost, one too small can rub toes and cause discomfort, and one that is adjustable can be uncomfortable to wear depending on its closure. Stretch toe rings are a solution to these issues with prior toe rings. Most stretch toe rings are made of a thin material that is invisible once slipped on the foot. This plastic/nylon combination works well as it is stretchy and conforms comfortably to the toe of the wearer and does not have any of the discomforts that adjustable metal toe rings offer. Some stretch toe rings are designed in such a way that the main part of the ring is all that shoes, thus showing floating charms or gemstones on the toe while the body of the ring is invisible. It provides a different look to the toe ring that metals cannot offer. There are even styles where the entire circle of the toe ring is gemstones, crystals, or beads and the stretchy material is not visible at all. Stretch toe rings often feature crystals, gemstones, semi precious stones, or beads as a part of the design. Depending on what they are made of, they can be quite expensive—such as stretch toe rings featuring Swarovski crystals—but most are quite affordable. Due to the absence of precious or semi precious metals, they are often cheaper in price. Sometimes they are easier to find too—most boutiques, clothing stores, department stores and some jewelry stores carry them. Those carried by jewelry stores feature more expensive stones of the precious or semi precious variety. Stretch toe rings found in boutiques often feature faux stones or imitation metals. 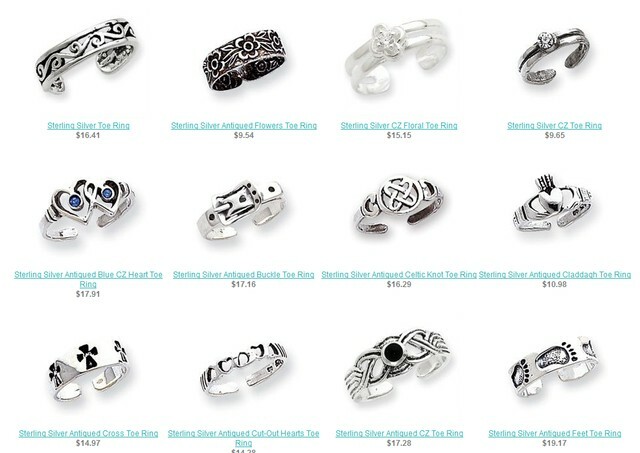 Online shopping is another way to find stretch toe rings, and this is often the best way to find a wide selection of styles and designs. One problem with stretch toe rings is that the wearer has to take great care to not break them. Since they are made of stretchy material, it can be easy to catch the toe ring on shoes or other objects. Wearing them while barefoot is not a good idea as they can become caught on objects and snap easily. The only downside to these rings is that they can become easily damaged or broken; therefore the wearer must take great care of them. As for the stone parts of the rings, they can be brushed lightly with baking soda and water regardless of the material they are made of. Stretch toe rings can be a great gift or addition to a personal jewelry collection. This style of toe ring makes it possible to comfortably wear more than one at a time without discomfort.